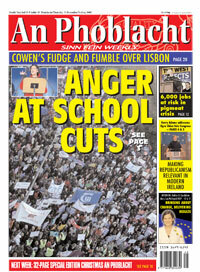 WIDESPREAD public anger at cuts in education was manifested on the streets of Dublin as some 60,000 marched in Dublin last Saturday in the biggest demonstration since the early protests against the war on Iraq. The march by teachers, parents and children was part of a series of state-wide protests against education cuts under the banner of ‘Schools United’. The huge march and rally was organised jointly by the Association of Secondary Teachers Ireland, the Irish National Teachers’ Organisation and the Teachers’ Union of Ireland. With other demonstrations previously taking place in Galway, Cork, Donegal and Tullamore, over 120,000 people have now marched against the Government’s Budget education cuts. The Dublin marchers protested against increases in the pupil:teacher ratio, the removal of free book schemes and English support teachers, the condition of school buildings, and the removal of grants for Traveller education. Addressing the rally, Sinn Féin Dublin MEP Mary Lou McDonald called on Education Minister Batt O’Keeffe (renamed on some placards as “Batt Out of Hell” and “Batt O’Thief”) to have the humility and common sense to reverse the cuts and put in place a programme of investment into Ireland’s education system. “There is one single demand that teachers, families and students here today must unite behind – reverse all cuts in education. “The economy is in recession. Successive Fianna Fáil-led governments have refused to invest Ireland’s wealth in our public services, leaving us now with an education system that is poorly funded and over-stretched. “Education is an investment. It is an investment in our children. It is an investment in this country’s future. It is a social and economic obligation of the state to deliver on, regardless of economic circumstances. “We simply cannot afford to let the Government have its way on this issue. “Ireland cannot afford to have our children schooled in substandard prefabs and overcrowded classrooms. We cannot afford to have a generation of socially disadvantaged children without access to the books and schooling supports they need. We cannot afford for children with special needs or whose first language is not English to be shunted aside. The Sinn Féin MEP said that the Education Minister’s row-back on substitution cover last week was not enough. “We need all the cuts reversed and a shift in policy by Fianna Fáil and the Greens. We need to see a real commitment to education. We need to see an acceptance by Government that education and the country’s economic future are inextricably linked. The Sinn Féin party chairperson added that the National Development Fund can and should be used to deliver a school-building programme. Making all discretionary tax relief schemes available at the standard rate of tax could yield up to €1bn for the Exchequer. Speaking in the Dáil on Monday, Sinn Féin TD Caoimhghín Ó Caoláin called for the immediate reversal of the savage education cuts after the massive Dublin march and rally. “The Government should immediately reverse the savage cuts in education which are punishing children, teachers and parents for the economic mismanagement of the Government.